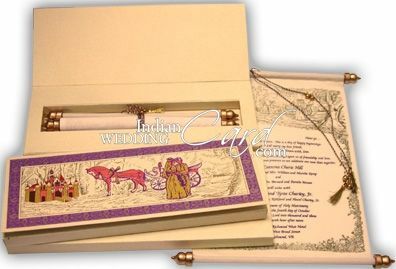 S52, Cream Color, Scroll Invitations, Jewish Invitations, Cinderella Wedding, Fabric Scrolls. It’s the most stylized form of the traditional scroll in the shape of a Christian/modern scroll card. The box front shows a traditional paisley design border frame in gold over a purple base. The image window shows a very scenic multicolored image of a old English castle and golden trees in the background, taking the primary focus is the image of the bride and the groom by a horse cart. The cloth scroll has the same composition in golden printing with floral borders. The mailing box pattern envelope is plain. Beige colored velvet cloth scroll card, box and mailing box envelop on offset printed silk texture on buff card sheet (300gsm), with plastic bars & golden ends and matching tassel.